Sen. Susan Collins, a Maine Republican, defended her support for newly confirmed Supreme Court Justice Brett Kavanaugh on Sunday. She said she found no corroborating evidence for Christine Blasey Ford’s accusations of sexual assault. Democratic lawmakers, organisations, and activists have spoken out to denounce the centrists’ support for Kavanaugh. Sen. Susan Collins defended her support for newly confirmed Supreme Court Justice Brett Kavanaugh, and said she found no corroborating evidence for Christine Blasey Ford’s accusations of sexual assault. Ford said Kavanaugh sexually assaulted her at a small house party when the two were teenagers, and detailed her allegations under oath before the Senate Judiciary Committee. Host Dana Bash pressed Collins, adding that Ford had testified that she was “100 per cent” certain that Kavanaugh was the person who assaulted her. Collins said though Ford’s testimony was “very compelling and painful,” she had asked herself whether it was “more likely than not” Kavanaugh assaulted Ford. A number of conservatives, including President Donald Trump, have said they found Ford’s testimony convincing, but doubted that she had identified the correct man as her alleged attacker. 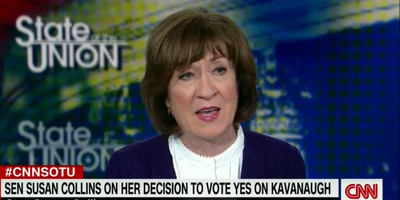 Collins, a Republican, who provided a critical “yes” vote to confirm Kavanaugh, rebuked lawmakers’ disapproval of Kavanaugh’s testimony. She said at times he had “stepped over the line,” but his emotional testimony was understandable. Kavanaugh was confirmed to the Supreme Court in a narrow 50-48 vote in the Senate on Saturday afternoon after one of the most contentious nominations in decades. Ahead of Saturday’s vote, eyes were also on three other key swing votes, one of whom denounced Kavanaugh in a Friday floor speech. Republican Sen. Lisa Murkowski of Alaska broke with her party that day to vote against advancing Kavanaugh’s confirmation, and took aim at parts of Kavanaugh’s testimony she said displayed inappropriate partisan interest and a short temper. This isn’t just another vote. @SenatorCollins has made it clear that she can no longer call herself a women’s rights champion. She has sided with those who disbelieved, disrespected, and even mocked survivors. Collins also shrugged off Bash’s mention that her support for Kavanaugh had drawn more than $US3 million in funding for her opponent in 2020 and a public challenge from former President Barack Obama’s national security adviser.